Elaine's Bed and Breakfast is a boutique hotel, gourmet restaurant, Victorian pub and amazing dinner theater located in the heart of downtown Cape May, NJ. They offer walking ghost tours of Cape May nightly, and host special Ghost Hunter weekends in the spring and fall. 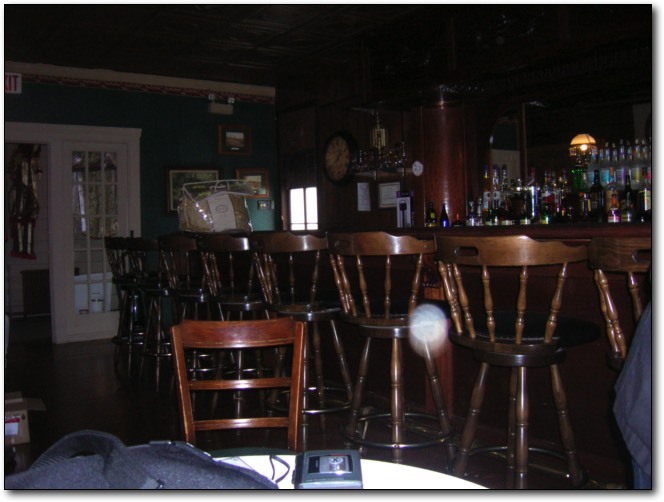 The inn has several resident ghosts, including James, the dark figure who haunts the bar, two small children who frequent the first floor and rooms 1 and 2, and a feisty Irish maid on the second floor. The most famous ghost is that of Emily, who often haunts room 3, along with her possible nursemaid. Then there is the presence in room 6, the most haunted room that has seen some guests flee in the middle of the night. There is even a ghost cat name Streak who roams the entire inn, but is often felt brushing the legs of bar patrons. In the dinner theater we ask, "Can you tell us your name?" A child answers, "Sarah." We ask here if it is 2010, which it was not, and a voice let's us know this by answering, "No"
During a ghost box session in the bar we ask if anyone is here. A man's voice replies with the name, "James." Also through the ghost box we ask the dark figure, possibly James, if they hurt anyone. We get the response, "Yes." In the old haunted mansion restaurant we asked about the cat's name and was told it was Streak. While using the ghost box we ask if the ghosts have something they want to tell us and are told, "Forgive me." In this ghost box session we ask if the ghosts can make a noise. We are told, "It may take awhile." We wonder how many ghosts are with us and are told, "Six." In this EVP we heard a noise and remarked it seemed to be coming from the porch area. A voice responds inviting us to come. We ask if there is someone by one of the investigators, Amanda, and a voice responds over the ghost box, "Here." In these two files first we ask, "Is anybody here with us?" and it sounds like a voice replies, " Carmella." You will hear divining rods jingle and a bizarre sound which is actually backwards speech saying, "That's me." The second file you can hear this reversed. We then ask, "Can you tell us you're name?" and get the response, "I can't (I can?)"